Shopping around? 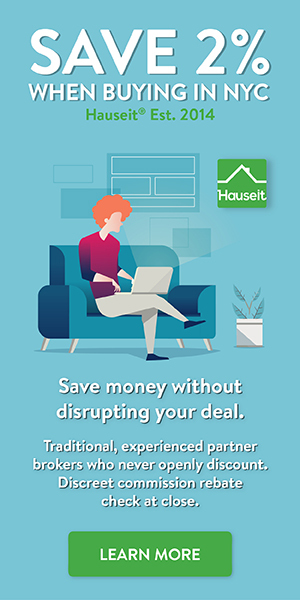 Hauseit’s brand name partner brokers will match the best deal you find online. Save up to 2% on your next NYC property with a discreet home purchase rebate from one of our experienced, traditional partner brokers! Why risk the biggest purchase of your life with a questionable discount broker? Save your hard earned money without risking your deal by working with one of our brand name, traditional partner brokers who never openly discount and thereby tarnish their reputations. NYC home buyers can discreetly save $20,000 or more on their purchase by working with a highly experienced REBNY Member buyer’s broker and taking advantage of a NYC broker commission rebate. Forget about aggravating the seller and listing agent and skip the embarrassment by discreetly receiving a rebate of the buyer’s broker’s commission after closing! Save thousands on your purchase and sign up today! Ready to Sign up for a Home Purchase Rebate on Your NYC Property? Please list any specific properties you may have already identified! If you prefer to speak later, you can request a call for a future date and time. We value your time. Your introductory call won't take more than 10 minutes! What Is Title Insurance and Is It Necessary for NYC Home Buyers? How Much Do Realtors Make in NYC?